The first time I focussed my binoculars on a Blue-faced Honeyeater I was amazed at the brightness of its blue face. It was one of those special moments we sometimes get while birding. As a result of that first great encounter, I enjoy every subsequent observation of this species. On the downside, not every sighting is as good as the one I had earlier this year in one of the walk through aviaries at the Adelaide Zoo here in South Australia. Being a captive bird quite at ease with hundreds of visitors to its home daily, this bird was quite happy to pose for me – or was it just too hungry to fly away. Note the identification band on the right leg. 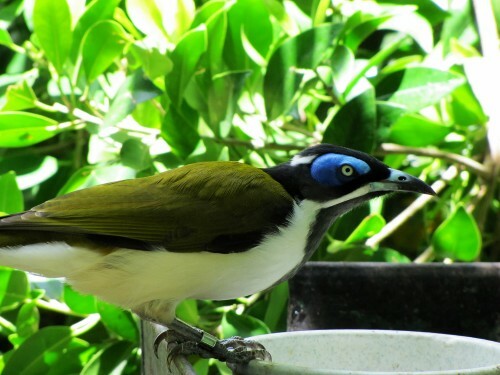 The Blue-faced Honeyeater is found along coastal northern and eastern Australia, often found far inland from the coast where there is suitable habitat. In south eastern parts of our country it is more of an inland bird, generally avoiding the higher altitudes in Victoria and southern New South Wales. Its preferred habitats include open forests, watercourses, woodlands, orchards, parks and gardens and farmlands. For more of my photos of this species and another article click here.